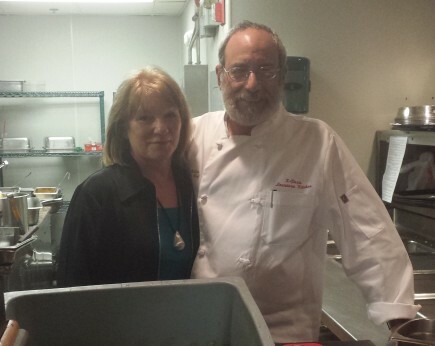 Brenda Prudhomme and Chef Paul Miller. Photo courtesy of Lori Bizzoco. The thought of working with one’s spouse may seem like a surefire way to negatively impact a marriage. Being unable to take some “me time” after a heated argument can not only take its toll on the relationship, but it can negatively affect the couples’ work environment. However, for some couples, finding that balance is not only simple, but it can also be their secret to a successful business. One of those duos is K-Paul’s Executive Chef Paul Miller and Accounting Manager Brenda Prudhomme-Miller. Meeting this couple was just as exciting as dining at the legendary K-Paul’s Louisiana Kitchen in New Orleans. Upon our arrival, we were escorted to a lovely table on the second floor of a very bustling room. Soon after we sat down, we were greeted by Paul and Brenda, who joined us for the next two hours on our culinary journey, all the while sharing with us their day-to-day lives and their not-so-complex secrets to a successful restaurant and 18-year marriage. Turtle soup, gumbo, and frog legs — oh my! These dishes may not be a staple in this native Brooklyn girl’s diet, but in the spirit of experiencing authentic Cajun/Creole fair, I knew K-Paul’s, established and thriving since 1979, was the place to sample such items. Both from Opelousas, there’s no doubt that Paul and Brenda take great pride in serving food they grew up eating. After all, one of the best ways of connecting with people is through food, and connected I was. The turtle soup was definitely an unexpected surprise. Prepared with turtle meat and beef tenderloin and then simmered in beef broth, this savory soup conjured up childhood memories of stews my grandmother would prepare. My friend, who vowed to order gumbo in every establishment in New Orleans, proclaimed K-Paul’s gumbo the best. It wasn’t too thick; it wasn’t too thin; it was just right — and no, her name isn’t Goldilocks. As for the frog legs, they were gigantic and very tender, and unlike many other descriptions I’ve heard in the past, they didn’t taste like chicken. They have a mild “fishy” quality that made them surprisingly light. 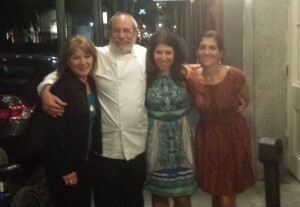 Brenda Prudhomme, Chef Paul Miller, Lori Bizzoco, and Barbara Merrill. Between smacking my lips and reaching into the plates of my companions, we talked about how Brenda and Paul met. Paul first met iconic Chef Paul Prudhomme in 1975, where he worked under his direction at Brennan’s. From there, the two formed a connection compelling Paul to follow Prudhomme to Commander’s Palace in 1977 and finally to K-Paul’s in 1981. Enter Brenda, Chef Prudhomme’s niece. She was visiting her uncle at the restaurant one evening, and as they say, the rest is history. The couple has three children between them, all of whom live in New York. With the exposed brick walls, white table linens, and terrific wine list, it’s no surprise that K-Paul’s has been the setting for hundreds of marriage proposals and even a few weddings. While tasting the evening’s special — the Surf & Turf, a light and flaky, perfectly seasoned, blackened Louisiana Drum and a very tender filet in debris sauce (yes, debris sauce, but don’t let the name fool you) — we discussed how Brenda and Paul reconnect with one another in the evenings and on their one day off. Brenda likes to “wash the day away” as soon as she gets home and just focus on her time with Paul. They enjoy watching something that helps them unwind and laugh together; Modern Family seems to do the trick. As for cooking, well, they both do it. Brenda explained that she prefers a low-sodium diet, so on their day off, there’s one bottle of wine but two skillets on the stove. One of the most impressive facts I learned about K-Paul’s is that they don’t have a freezer. Everything served was purchased for that day. Paul explained that, while we were dining, the shrimper he uses was out catching shrimp for tomorrow’s menu. Sharing the pressure of serving the freshest ingredients is a real testament to how in sync Paul and Brenda really are. Their love for the restaurant in undeniable, but their ability to put it behind them and enjoy their alone time is really the key to their marital success. For more information about K-Paul’s, check out their website, http://www.kpauls.com/. You can also follow them on www.facebook.com/kpaulslouisianakitchen and Twitter @kpaulslakitchen.